North Dakota – On Sunday, November 6, people protecting the water from the Dakota Access Pipeline (DAPL) held actions of varying militancy at three different locations. Around 10 a.m. on Sunday, a group of several dozen water protectors drove into Bismarck and held a demonstration at the Fairview Cemetery, the oldest cemetery in the city. The cemetery was chosen as the site of the demonstration to highlight the desecration of ancient burial sites that has taken place during construction of the Dakota Access Pipeline (DAPL). The water protectors at the cemetery spoke about how they came in prayer and although they were equipped with shovels, they would not dig up the remains of North Dakota’s ancestors. 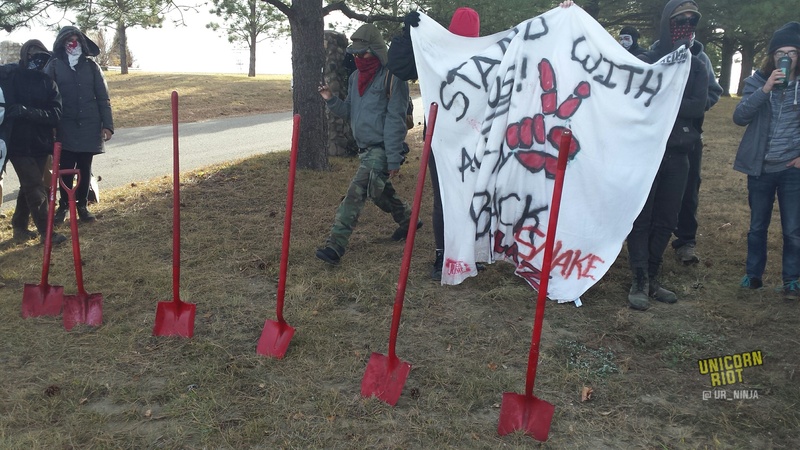 Red shovels displayed at the cemetery demonstration. 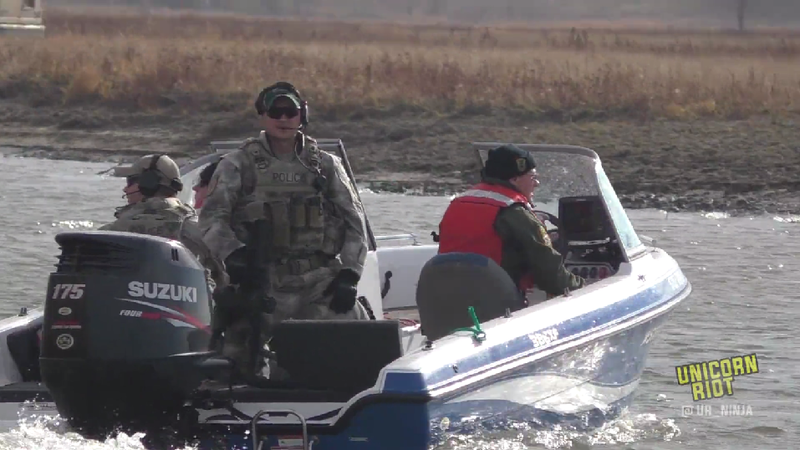 Bismarck Police and Burleigh County Sheriff’s deputies were present in the road near the demonstration but did not approach or speak with the water protectors. About an hour after it began, the demonstration dispersed without any arrests. 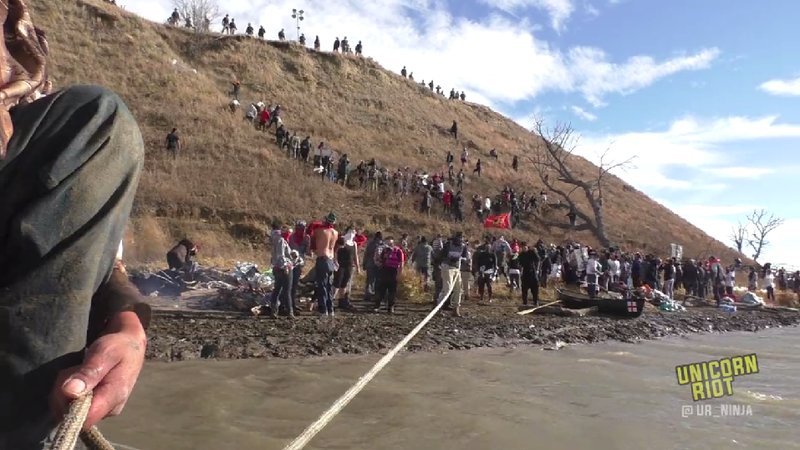 Meanwhile, on land near the Oceti Sakowin camp, another group of water protectors crossed the Cantapeta Creek (an offshoot of the Cannonball River) to set up camp on the land formation now referred to as “Turtle Island“. A small group of water protectors began the action by canoeing across the creek and upturning four canoes to create a barricade against police attack. The group also erected barricades of driftwood on the east and west ends of the small beach to ensure the police would not be able to easily move towards them. They then began to ferry more water protectors across the creek, amassing nearly two hundred people on the beach head. SWAT officers in boats churned the waters and launched tear gas canisters onto the beachhead. Water protectors wearing protective gear moved towards the canisters and neutralized them by covering them in mud. As the numbers increased on the island, the crowd started to form a line and chanted to each other to move together and take the hill inch by inch. The mass of people advanced up the steep incline as law enforcement launched more tear gas into the crowd. When they neared the top, someone describing themselves as an elder appeared and shouted down those who had gathered. The crowd at first hesitated, but then began to join him as he told those gathered that they were desecrating those buried there. 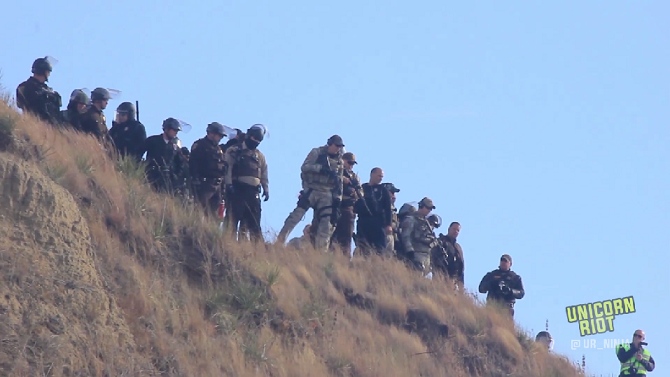 Some water protectors pointed up at the police who’d been stationed on the hill for days, and stated they were the ones desecrating the burial site. One man, who claimed to speak on behalf of Standing Rock Tribal Chairman Dave Archambault II, said that the water protectors needed to disperse because tribal negotiations with the U.S. Army Corps of Engineers had led to a 30-day halt of all work on the Dakota Access Pipeline. As the man repeated this claim to the crowd, DAPL excavators could be seen digging across the river. Arguments ensued and the crowd eventually gave in to the wishes of the elders and moved back to the main Oceti Sakowin camp. Construction on the Dakota Access Pipeline continued all day Sunday, and large booms could be seen lowering the pipeline into the ground that was formerly the Oceti Sakowin 1851 treaty camp.